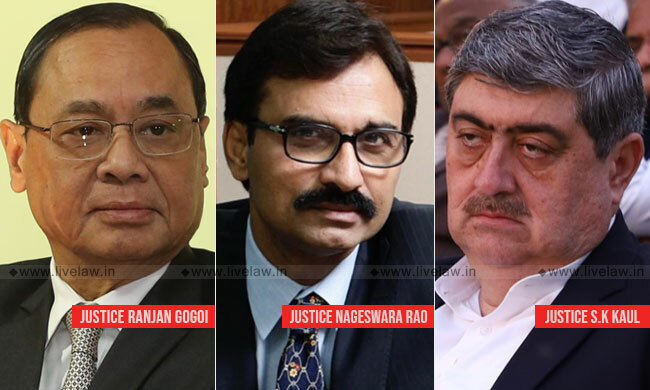 The bench, also comprising Justices L. Nageshwar Rao and S. K. Kaul, was satisfied that in view of the earlier orders of the apex court, Justice Bedi, as the head of the court-appointed Monitoring Committee, was entitled to submit the report. The court rejected Solicitor General Tushar Mehta's preliminary objection, on behalf of the state government, as to the validity of the final report submitted to the court in February last year. It was his claim that the report is not on behalf of the Monitoring Committee but an independent endeavour by Justice Bedi and He had advanced that the court should consider whether a copy of the same should be furnished to any of the petitioners or their counsel. Having perused the 10 interim reports and the final report, the bench of Chief Justice Gogoi and Justices Kaul and K. M. Joseph had on December 12, 2018 deemed it fit to procure Justice Bedi's opinion on the matter. "whether the report is by Justice Bedi or by the Committee with Justice Bedi as its Chairman is a debatable issue; there are two sides to it...if Justice Bedi says he has shared the report with the other members of the Committee, the issue can be put to rest", the Chief Justice had observed. Accordingly, the bench had requested former Supreme Court Justice Bedi to communicate his views on whether the final report was drafted in consultation with the other members of the court-appointed Monitoring Committee of which Justice Bedi is the Chairman. In his reply, Justice Bedi assured that the final report had come to be prepared after deliberations among the members of the Committee and that it was the express intention of the top court that all reports be submitted under the signature of the Chairman. Asserting that a copy of the report, by virtue of the same having been written by a former judge of this court who was trusted in this behalf by the court itself, deserved to be shared with the petitioners, the bench, however, clarified that the findings of the report have not been accepted by the court as of now and the parties are only being allowed an opportunity to file their responses to it. On Wednesday, the Chief Justice also expressed his displeasure at the request of the state of Gujarat for an adjournment on account of the SG being engaged in another court- "if the Solicitor chooses to prioritise other courts over this Court 1, then alternate arrangements must be made for this court...the state government cannot keep on asking for the matter to be deferred"
Advocate Prashant Bhushan, representing the petitioners, had contended that all the interim reports on the subject have also been by Justice Bedi and that the orders of this court make it clear that they are meant to be the Chairman's reports only. He had drawn the attention of the bench to an earlier order dated March 2, 2012 placing the Committee under Justice Bedi's headship and requiring the state of Gujarat to extend full cooperation to it. Further, Mr. Bhushan had pointed the order dated July 26, 2013 where it was recorded that "Hon'ble Mr. Justice H. S. Bedi (Former judge), Chairman, Monitoring Committee has so far submitted five status reports in this court", directing the Registry to furnish copies of the same to the counsel for the parties. "This court has entrusted the inquiry to the Chairman alone", he insisted. Countering, the SG had placed reliance on another order of August 14, 2013 recording that "The Monitoring Committee appointed by this Court headed by a former judge as its Chairman" submitted its sixth status report. "the intention behind the Constitution of a monitoring authority was to reap the benefits of the deliberations among its members who are experienced in varied fields. All earlier reports were submitted after discussion. One of the ten reports mentions the record of the proceedings when the meetings were convened...", he pressed. "How can you say that the report is not by the Monitoring Committee? ", the Chief Justice had asked. "the Committee decided its own procedure for submitting the reports. They have are prepared by the Committee after consultation with and deliberation among all its members and submitted under the signature of the chairman...This report was submitted to the court by Justice Bedi in ten copies in sealed covers, leaving it to the Supreme Court to supply copies of the same to the parties and their counsel...on enquiries, we learnt that the other members are not aware of this report...", replied Mr. Mehta. He also clarified that the Committee was first constituted by the state government pursuant to order of this court, and subsequently by the apex court. "The local police was not trusted and hence, an independent body was established. The Special Task Force (STF) was constituted to investigate encounter deaths, and the Monitoring Committee to oversee these investigations, to Guide and instruct the STF as to the investigation and to Receive complaint of any encounter death as well as inputs and suggestions from a relative of a victim...the Committee was to be headed by a former judge and to comprise of the DGP, the Director, Forensic Science Department, FSL, Gujarat government, a member of the Human Rights Commission, the District Judge for the district where an encounter death has transpired...", he elaborated. "In all the previous reports, there are the minutes of the Monitoring Committee meetings which indicate the deliberation by its members. Then the report is placed before Your Lordships under the signature of the Chairman...", stressed the SG. On the point of locus, the petitions having been filed by journalist B. G. Verghese and renowned lyricist Javed Akhtar, he sought to argue, "since 2012, I have been contending on affidavit that this is not a bonafide litigation. The petitioners before Your Lordships was a journalist from Delhi and a lyricist who is based in Bombay. Why is The public conscience, the public spirit restricted to encounters in a specific state. This is a rampant abuse of Your Lordships' jurisdiction..."
"No, we are not going into this", the Chief Justice had stated.